At NAB 2015 Clear-Com® will present a range of connectivity solutions, namely the recently launched LQ Series, ProGrid and Clear-Com Gateway. Clear-Com will demonstrate how communication solutions can be effortlessly expanded over IP, Fiber or gateway technology, ensuring people on disparate systems can communicate and coordinate at critical moments and move signals from video, audio, intercom and control data within a large facility or to many remote locations. LQ Series devices provide intercom connectivity for linking multiple intercom systems together and/or extending the capabilities and intercom channels of a single system to one or more remote locations over IP networks. With either the two-wire (LQ-2W2) or four-wire (LQ-4W2) option, LQ can interface with and route audio and call signals between any industry-standard partyline intercom and 4-wire devices such as matrix intercom systems, analog telephone circuits, two-way radio gateways and audio consoles over LAN, WAN or Internet. LQ offers the simple and cost-effective alternative for connecting visiting systems or ad hoc users, eliminating the need for time-consuming and costly audio cable runs. These two-channel devices are light-weight, portable and compact. They are easy to deploy over the browser-based Core Configuration Manager: just preconfigure the devices with the appropriate IP addresses and audio routes, deploy the devices to the remote location(s), and then the LQ devices are automatically connected. In a given production setup where a distribution backbone is required, ProGrid enables users to connect, transport, distribute and route audio, intercom, video and control data to critical production areas over the fiber-based network. Based on the open AES3 and AES10 (MADI) standards, all serial data, HD SDI feeds, sync, analog, AES, MADI audio with timecode and all major brand intercom signals are transmitted synchronously at extremely low latency and across long distances over ProGrid. The ProGrid family consists of Analog Audio Devices, Intercom Interface Devices, Digital MADI Interface Devices, AES/EBU Connectivity Devices, and Yamaha Interface Cards. The platform is scalable and modular, allowing users to expand and adapt to infrastructure changes. Up to 1024 channels can be matrixed across short or long distances. 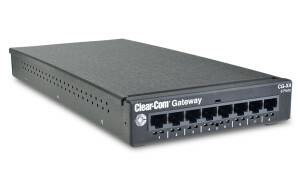 The Clear-Com Gateway family is the ideal interoperability solution for on-site communication across different communication systems in live events, multi-site venues, security services and many other applications. The Clear-Com Gateway CG-X1 and CG-X4 devices provide a flexible and cost-effective platform for linking and bridging disparate communication systems such as IP networks, telephone networks, radios and intercom systems, for highly-coordinated, critical operations. A crucial feature of Gateway is the ability to interface radios and SIP devices on a single network in order to facilitate communication across different platforms of users. Clear-Com Gateway devices also bridge radio channels across different radio platforms, port-to-port, port-to-multi-port and Radio-over-IP (RoIP), enabling cross-communication between different frequencies. Clear-Com’s connectivity solutions, together with the complete Clear-Com line of new and enhanced communication solutions, will be available for demonstration at NAB 2015 on Booth C5409.